It's encouraging to know that the rest of the world is just as excited/interested in Obama's presidency as I am. 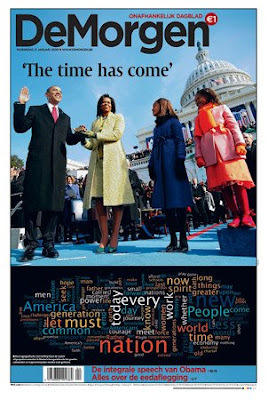 Here is a link to The Guardian's photo archive of worldwide media outlets' front pages Wednesday morning. On the left you can navigate through the 48 different newspapers that put Obams on their cover. What a refreshing site to see. Above is from a Belgian news source called De Morgen. Although probably extremely altered in Photoshop, I still think visually the colors are pleasing.